A visit to TWO Quilt Shows in just two weeks! A visit to a quilt show is always more fun with friends, and two shows on two consecutive weekends makes for even more fun! The first show, AQS Quilt Week in Lancaster, PA, was a two-day bus trip (March 29-30, 2019) that included an overnight stay and plenty of fabric shopping, too. Lancaster is a quilter’s mecca, with beautiful scenery, delicious food, and the presence of quaint buggies, bike-scooters, and other wonderful Amish things like shoo-fly pies. This year’s quilt show did not disappoint. I took very few photos at the show mostly because I was busy chatting with friends, but those that I did take were of quilts that grabbed my heart. I’ll show just a few of them to you here, complete with titles and attributes to the talented quilters who were generous enough to share them with the public. The quilt above, ABC Frippery, was selected Best of Show. I was stopped in my tracks by its astonishing detail and workmanship. The maker is Janet Stone of Overland Park, KS. Janet is a previous winner of the AQS Best of Show award, and is known from her many fabulous alphabet quilts, as well as for including a sheep in every one of her quilts. This one was no exception. It took a while, but I finally located the sheep. It’s in a tiny gold locket hanging just under the “M”. Janet quilted this beauty on her stationary machine. It includes machine appliqué, beading, bias work, couching, crystals, embellishments, free motion quilting, and machine piecing. Wow. Look at that little basket block! Upstairs in the Lancaster convention center was another special exhibit, “35 Years of AQS Anniversary Showcase Preview: Collection of The National Quilt Museum.” The exhibit showcased 15 previous Best of Show quilts on loan from the National Quilt Museum’s permanent collection. Below is a photo I took of Caryl Bryer Fallert-Gentry’s Midnight Fantasy #10. 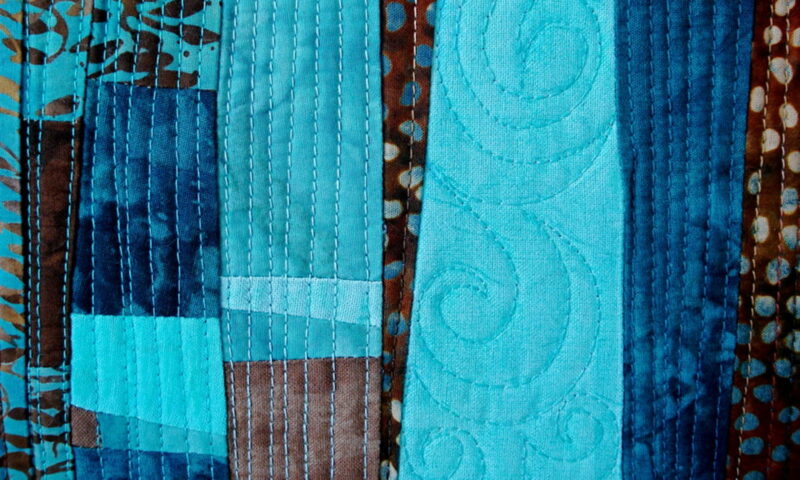 Caryl is one of my quilting heroes. She was one of the innovators of machine quilting, making it an acceptable art form back in the old days (the 1980-90’s) when quilting by machine was controversial, and only hand-quilted quilts were thought of as “real” quilts. It is always wonderful to be able to see one of her masterpieces in person. The second show, The Smithtown Stitchers -The Joy of Quilting was last weekend (April 6-7, 2019). While there, I happened upon one of my students, Rosalie Wong, smiling beautifully in the photo below with her Best of Show award-winning quilt! She had met with me just a few weeks ago, for a little help in deciding how to quilt her magnificent masterpiece. I was proud and flattered to have been a part of the process that produced her gorgeous quilt! Congratulations, Rosalie! A well-deserved award! Quilt shows are wonderful. They provide us with not only beauty to gaze upon and enjoy, but the opportunity to connect with other quilters and share the joy that quilting brings us. Aren’t we lucky to have such opportunities? This is a great video posted on facebook by Bernina/We All Sew covering really basic info about warp, weft, bias, selvage, etc. Every quilter needs to know this! Today, the amazing and uber-talented Teri Lucas posted an interview with me on her blog. It was incredibly fun to answer her great questions! Teri is such fun to be with. She has a sparkling, slightly snarky (in a good way) sense of humor that can, and has, caused her dining companions to snort loudly when they laugh. One of the best outings I’ve ever experienced was a lunch with Teri and Melanie Testa. The three of us laughed so uproariously that people at other tables who were innocently trying to enjoy their food gave us dirty looks and may have even muttered under their breath more than once. It was a lunch I’ll never forget. Teri’s blog currently details her travels as an independent sales representative for Benartex, Northcott, Banyan Batiks, and Figo. She’s a good storyteller. Check it out! She’s a fantastic teacher, too. Take a look at the Tutorials and Helpful Hints section of her website. There’s some really good stuff there. I alway make a point of telling my students that they need to be kind to themselves. “It makes no sense to be impatient with yourself,” I tell them during workshops I teach, “You are the most important person in your life. Be nice to you.” I even write it in my class handouts. It can be difficult to remember to take care of ourselves first. I’m reminded of the flight attendant’s instruction to first place the emergency oxygen mask over your own face before tending to your children. Outside pressures and responsibilities can interfere in our artistic lives, making it difficult to find the time and space that we need to fulfill our creative passions. When we can’t do that, we creative types tend to get cranky. And then those around us can get impatient with us. But it’s unrealistic to expect our friends and loved ones to be kind, thoughtful and caring towards us, if we can’t manage to feel those very things for ourselves. Thought for today . . . be nice. Give yourself a pat on the back for all that you have accomplished, and go easy on yourself for the things that may not be exactly as you’d like them to be. Things will change. They always do. It’s been said that you can’t go home again. Maybe that’s true. A person can’t go home again, in actuality, because everything always changes. We ourselves change when we change our surroundings. When we leave our homes, we encounter new things: a new geography, new people, new sights, new smells, new sounds; all these new things affect us, making us change our way of seeing, our way of feeling, and even our way of thinking about the world around us. We are often told not to dwell on the past. After all, you can’t change it, can you? What’s the sense of taking that trip down memory lane, when you’re sure to come out feeling depressed and frustrated and muttering “couldah, shouldah, wouldah.” Who needs to be reminded of all of their failures, all their mistakes, all their wrong turns and bad decisions? Better to leave all that in the past, where it belongs, right? Still, it can be a good idea to revisit the past every now and then. After all, there were good things that happened, too. Going ‘home’ again, and thinking about your past can be an excellent way to evaluate where you are in your life, and how you got there. Perhaps it can help to set a course for a new direction or a different way of thinking. The Quilt Whisperer is official. Yesterday I visited the county clerk’s office and filed a business certificate for The Quilt Whisperer. Today a piece of paper stamped with an official seal says I am my own boss. That piece of paper is framed and hangs in my studio, and the dream I’ve had for so long is a reality. There will be hard work ahead, but I love my work, and you know what ‘they’ say: loving your work is the key to happiness. I am passionate about teaching others the skills I’ve acquired during the many years that quilting has been my obsession. The joy I feel when a student’s eyes light up with understanding is everything to me. There really is nothing better than hearing a previously struggling student say, “Oh, this is how you do it!” Well, maybe there is one thing better . . . hearing a student say, with conviction, “I can do this!” That, to me, is the ultimate reward! If you are reading this, I thank you, and I invite you to join me on my journey as an independent quilt instructor — A Quilt Whisperer. I’m excited to see where this new road takes me! Enter your email address to receive notifications of new posts by email. Be the first to find out about new classes, retreats and other fun stuff!